Is Phosphoric Acid in Cat Food Bad for Cats? Phosphoric acid is used in cat food to ensure Mittens' urinary pH is ideal. Phosphoric acid isn't used in a lot of cat foods, but if you come across it in the ingredients list of Mittens' food, it's natural to wonder about its purpose. Though phosphoric acid s not dangerous, Mittens can do without the additive if she's eating a balanced, quality diet. Commercial cat foods are manufactured to produce a urine pH level between 6.3 and 6.7, considered to be the ideal range to maintain a healthy urinary tract. Cat food ingredients vary widely, not only across different brands but also within brands. Manufacturers use additives to meet a cat's nutritional needs, depending on the ingredients used for the specific blend of food. According to Natural News, approximately 12 percent of commercial cat foods use phosphoric acid. In some cat foods, phosphoric acid serves to maintain the ideal urinary pH. Evidence exists that phosphoric acid doesn't make cat food any tastier to Mittens. PetfoodIndustry.com reported on a study demonstrating the method for applying phosphoric acid to kibble impacted the palatability of the cat food for cats. The study revealed not so much that amounts dictated palatability, but the way the phosphoric acid was applied as well as the order in which it was applied with taste enhancers. Depending on the form of phosphoric acid and its place in the order of manufacture, cat food may be more or less appealing to cats. If Mittens is eating a diet high in carbohydrates, it's more likely her kibble contains phosphoric acid or another additive to help her maintain a proper urinary pH. There are a variety of reasons why a cat food may contain a high level of carbohydrates. Relying on plant-based proteins in lieu of meat-based proteins is cheaper for pet food manufacturers, resulting in a lower cost food at the store. High carbohydrate foods are often used for medical conditions, such as renal failure, when a cat's kidneys aren't processing nutrients efficiently. Not all high carbohydrate foods contain phosphoric acid. Instead of focusing on a single ingredient, focus on feeding Mittens a healthy, balanced diet. 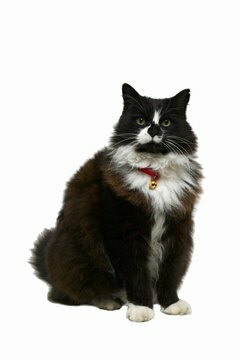 Dr. Karen Becker's HealthyPets.com recommends food made from high-quality protein, meaning meat-based proteins from muscle meat, moderate amounts of animal fat and no grains. Canned food is also a good option, as it tends to have a higher content of water -- good for urinary tract health -- and uses animal-based proteins. Finally, whether Mittens is in great health or has special dietary needs, an ample supply of fresh water is always necessary. What Are the Treatments for Canine Acid Reflux? How Does Tannic Acid Affect Aquariums? Is Boric Acid Safe Around Cats?